Today social media is practically the most popular method of communication. of course, personal contact, they do not replace, but are able to bring people with the same interests from all over the world. 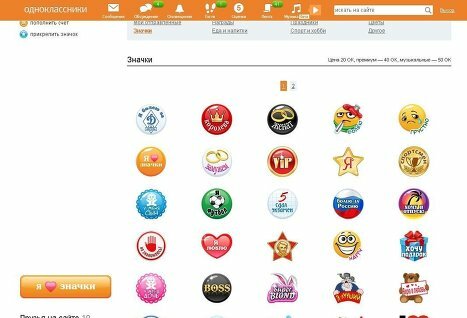 The most popular today are considered two sotsresursami: Odnoklassniki and VKontakte. Both networks do not cease to compete with each other for supremacy among users. And of course go to all sorts of steps, which make site visits more enjoyable and interesting. So, eg, network Classmates recently introduced a new feature to "attach"icon. With this service you can inform your friends about your mood or about some event in your life. To attach icon Odnoklassniki, you must first fund your account. As payment for all services in this network is "local" currency – the so-called "OK". "Oki" can be put into your account by depositing the balance. To do this, under your avatar, select the menu item “add account”. Before you pop-up window, which will offer you several payment options. It can be electronic money, bank card, Recharge via phone or in self-service terminal. You need to choose the most convenient way for you to, and, following the instructions, fund your account in social networks. After that, as your balance appeared “currency” you can use the services of the resource. under the pic to select the menu item “attach icon”. A window will appear, in which the entire range of available icons for any occasion day and. Choose the most you like and click on it. After this action you will see its value in "OK". If you agree to pay the required amount, click on the button “attach” and enjoy your badge. You should know, that any icon, your chosen, will show off your photos in all seven days in a flashing mode. Then again you have to pay for the attachment of a new symbol. The fact, in Classmates, there is also the option “make a gift”. AND, probably, not know all, that gift also implies the attachment of a symbol to a photo of his friend. To carry out a pleasant effect, you need to select “make a gift”. Before you pop-up window, prompting you to select a reason for a gift: birthday, Valentine's Day, Spring, expression of sympathy and much more. With this feature, you can choose the most corresponding to the theme of the gift – icon. After selecting the desired character, click on it, and if you are satisfied with the price, it remains to press the “give”. Further, the site will ask you to choose the one, who will be presented with a gift. Is determined by the subscriber and pleases his gift. But it is worth remembering, now the network has several resources deceivers, offering free icons. Administration site Classmates in this case calls for everyone to be cautious and in no case did not respond to a scam. “No such service and can not be”- claims administrator classmates.